(Nanowerk News) A chemical nanostructure developed by Boston College researchers behaves much like the pores of the skin, serving as a precise control for a typically stubborn method of catalysis that is the workhorse of industrial chemistry. Boston College researches started with a metallic crystal. It was then coated with a "sacrificial layer" of copper oxide. 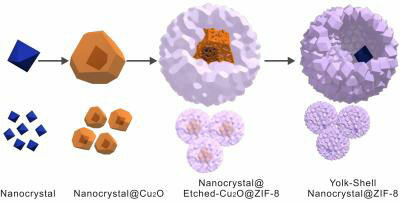 The application of ZIF-8 formed a porous skin that then etched away the copper. Within the resulting cavity, researchers were able to control the chemical reaction thanks to the skin-like shell of ZIF-8.